Quarterly glossy magazine with 67,000 paid subscribers and global distribution. platform to educate, nurture and support them. 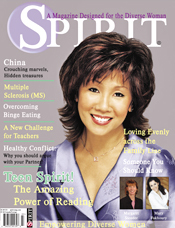 Editor/staff writer – Wrote and edited seven articles for two issues of Spirit including; several interviews and features for both teens and adult issues. Also was closely involved in idea generating and magazine development such research, networking and managing the “Teen Spirit” section.